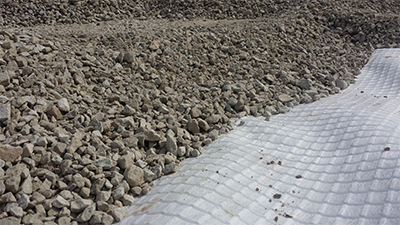 Combigrid® geogrids are the next generation of geogrids produced with state of the art manufacturing technology, unlike any other geogrid on the marketplace today. The reinforcement element is a highly oriented polypropylene or polyester bar that is uniformly extruded and drawn to achieve a high modulus and strength at low elongations. A three dimensional fibre matrix of the needle-punched Secutex® non – woven is placed between the Secugrid® bars during the manufacturing process and is firmly bonded with the reinforcement bars with the NAUE patented welding technology to provide a structurally sound and stable geogrid.